Bernd Volmer's DrawBot plotter: there's a quirky imperfection to plotter-drawn letters because they're oddly precise and imprecise at the same time. Is it type? Is it lettering? Either way, it has a lovely warmth and creates for interesting results. 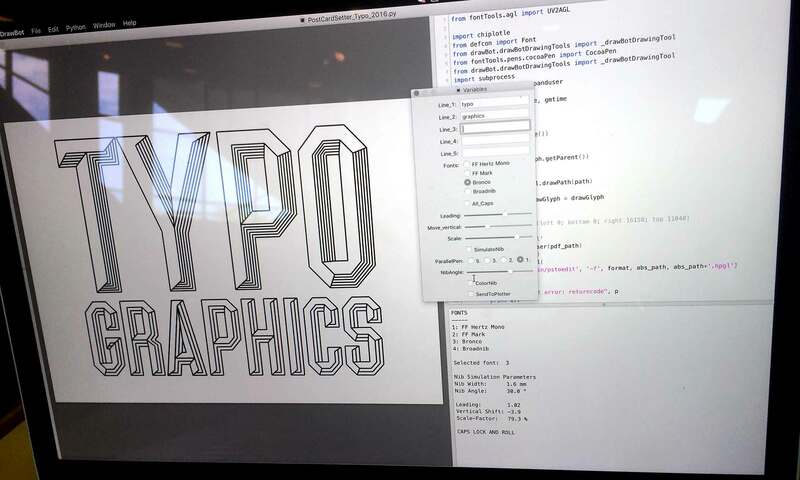 CJ Dunn reports back from TypoBerlin 2016. Last month I went to Typo Berlin, and while the name indicates it’s a type conference, it’s really a general design event. There was Jonathan Barnbrook on David Bowie, punk rock, and social responsibility. But then Ferdinand Ulrich convincingly presented the work of Gudrun Zapf-von Hesse as a vastly unde-appreciated type designer. TypoBerlin 2016 had something for nearly everyone. Tobias Frere-Jones spoke about screen fonts as an optical size, as a rehearsal for his Typographics talk. On hand at TypoLabs (which sounds a whole lot like TypeLab, no? ): a GX variation font (Bedhad Esfahbod and Just van Rossum), Python visualizations for type design (Nina Stӧӧβinger), and DTL tools in RoboFont (Frank Blokland). 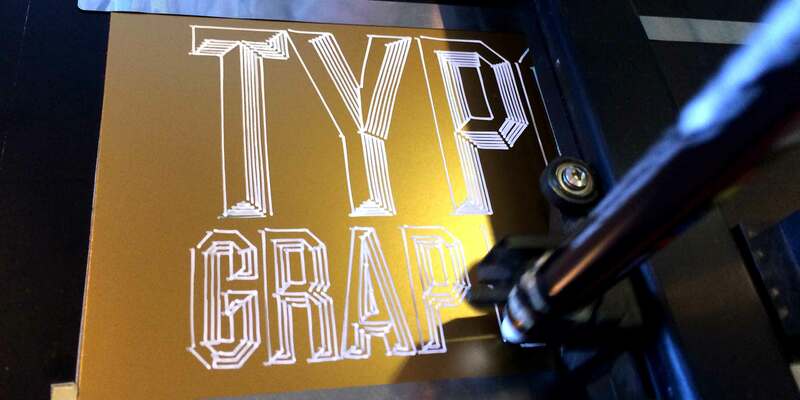 Participants explored new design space axes (Erik van Blokland) and a TypeCooker workshop. Plus, there were terrific parties at Alphabet Type and Lucas Fonts. 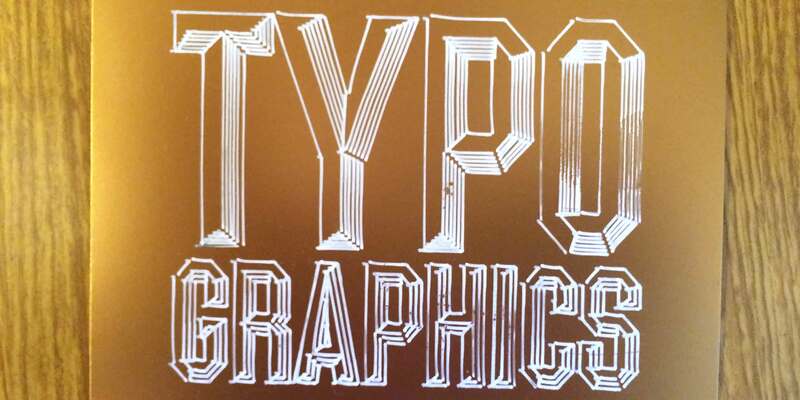 If you’re attending Typographics, here’s something I learned in Berlin: Check out everything happening outside and around the lecture for the full experience. Bernd Volmer’s DrawBot plotter interface. Bernd Volmer’s DrawBot plotter in action “drawing” type with a white plotter pen. Paul van der Laan helping to fix my giant ffl ligature. 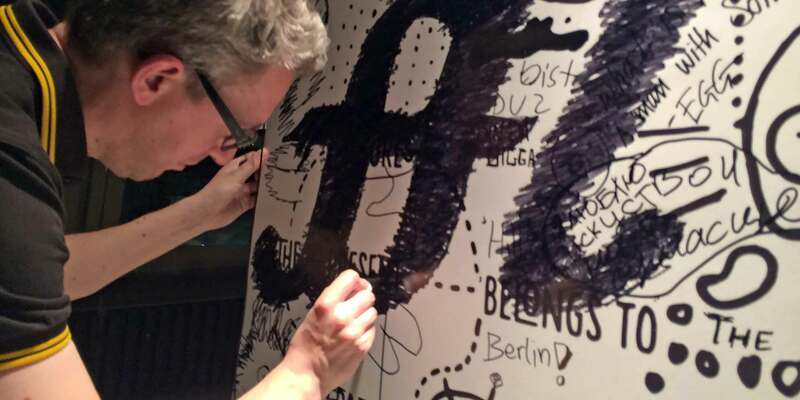 We used the giant lettering wall at the TypoBerlin closing party to try out the Gerrit Noordzij method of type sketching on a larger scale. 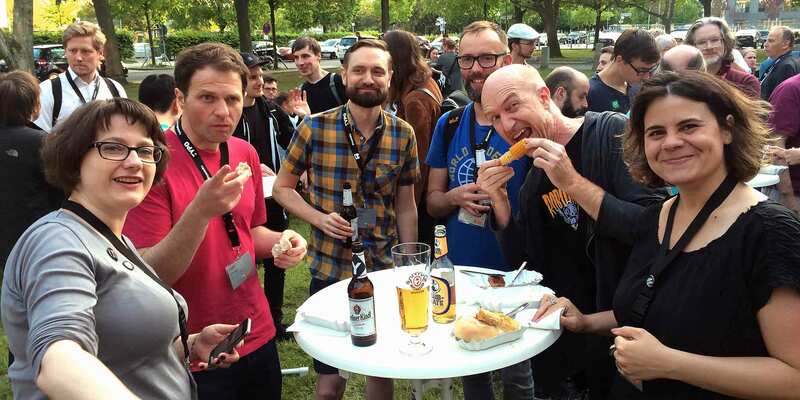 Enjoying the early-summer Berlin weather at the TypoLabs BBQ in the grass with delicious food, cold beer and great conversations. 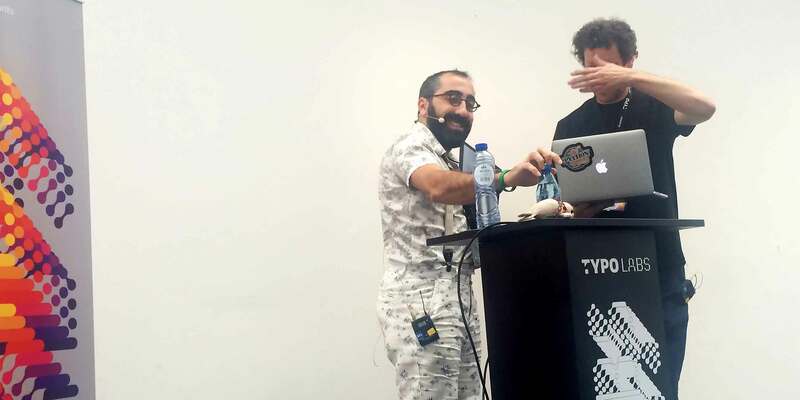 Erik van Blokland spoke about pushing the boundaries for experimental and non-linear typographic designspaces. 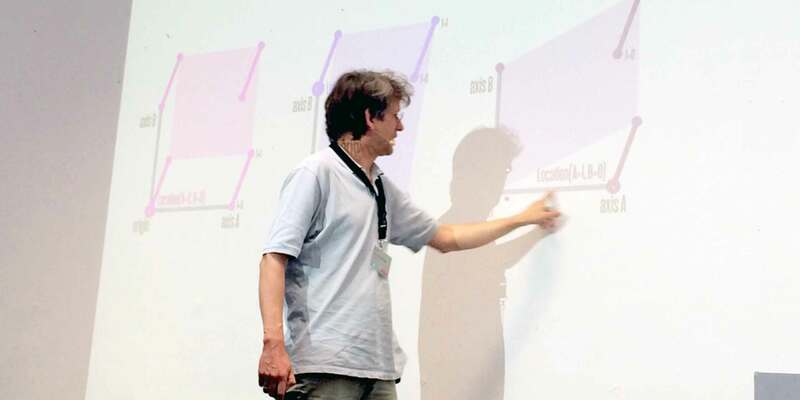 He's exploring his own secret axis for interpolation, what about you? 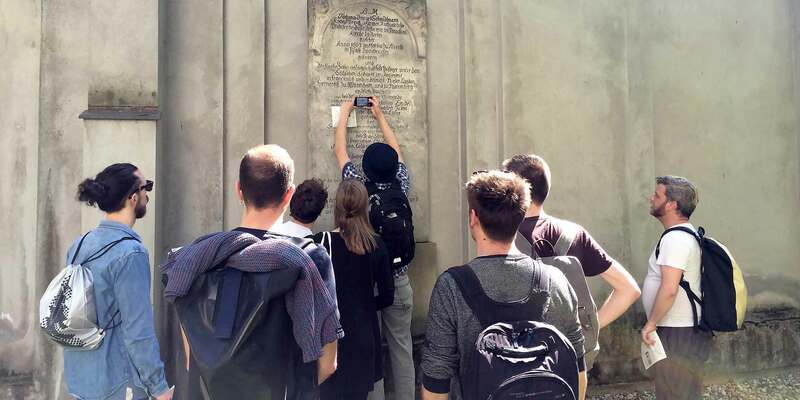 Type walk lead by Florian Hardwig for the TypeMedia 2016 students. Here Erik van Blokland captures inscriptional letters in a cemetery. “No photos please!” Bedhad Esfahbod & Just van Rossum talk about the past, present, and future of FontTools. These guys have a great sense of humor while doing some of the most technically complicated and important work in the type world.